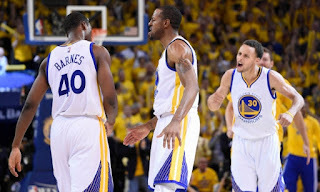 Stephen Curry had 26 points and eight rebounds, Harrison Barnes added 24 points and the Golden State Warriors advanced to the NBA finals for the first time in 40 years with a 104-90 victory over the Houston Rockets on Wednesday night. After decades of wishing and waiting for this moment, the Warriors have finally arrived. They shook off a slow start and sweated out a shaky finish in Game 5 to close out the Rockets and set up a matchup with LeBron James and the Cleveland Cavaliers beginning 4 June. All five Rockets starters scored at least 10 points, but MVP runner-up James Harden had a forgettable finale. Harden had a playoff-record 13 turnovers and scored 14 points on 2-of-11 shooting. Dwight Howard led Houston with 18 points and 16 rebounds. Confetti fell from the rafters when the final buzzer sounded. The Warriors shared hugs and handshakes, and the crowd chanted “M-V-P!” for Curry, who relished the moment on the court with his two-year-old daughter, Riley. “We deserve to celebrate tonight but we’ve still got unfinished business and it’s a long time coming for the Bay Area,” All-Star Klay Thompson said. Things got tougher on Curry when backcourt mate Thompson faked a shot that drew Trevor Ariza in the air early in the fourth quarter. Thompson absorbed Ariza’s knee to the side of his head, sending him to the floor. Thompson, who finished with 20 points, lay on the ground for a minute before walking to the locker room. He came back to the bench with what the team called a right ear laceration. The Warriors said he could’ve returned, but they did not need him. They started the fourth on a 13-4 run and held off Houston’s last-ditch efforts on free throws. Now it’s LeBron v Curry. The hype has already started for two of the most popular and entertaining players in the world to take center stage for the championship, and it has a week to build even more before starting at Oracle Arena. The conference title is the biggest accomplishment yet in what has been a rapid rise for a Warriors team that is beloved in the basketball-united Bay Area despite decades of futility. Warriors co-owners Joe Lacob and Peter Guber, sitting courtside next toKanye West, have turned the franchise into a contender since they bought the team in 2010. General manager Bob Myers, the NBA Executive of the Year, has constructed a talented roster around Curry that has exceeded all expectations. And first-year coach Steve Kerr blended it all together beautifully after Mark Jackson’s messy firing last May. The Warriors rolled to a franchise-record 67 wins in the regular season and had little trouble dispatching New Orleans, Memphis and Houston in the playoffs. Now they’re in the finals for the first time since winning the title in 1975 behind Rick Barry and coach Alvin Attles, who enjoyed it all sitting in his usual spot at the top of the arena’s lower bowl. It was a tough way for the Rockets’ run to end. They overcame a knee injury that sidelined Howard half the season to finish second in the West, played without starters Patrick Beverley and Donatas Motiejunas in the playoffs and rallied from a 3-1 deficit to beat the Los Angeles Clippers in the second round. The Warriors were one obstacle Houston couldn’t clear.